My government’s commitment is to do things with Aboriginal and Torres Strait Islander Australians, rather than doing things to them”. Malcolm Turnbull is at his best when he can rise above the overtly partisan fray. So it was on Tuesday that he gave one of the most powerful speeches of his campaign, at a hand-back ceremony marking the end of a decades-long battle for Aboriginal land that lies across the harbour from Darwin and covers most of the Cox Peninsula. 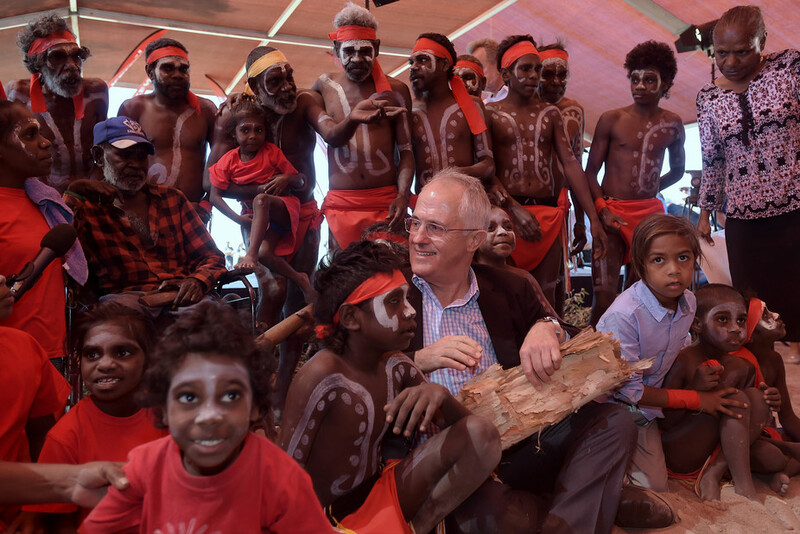 Before becoming prime minister, Turnbull had said little on Indigenous affairs. He had mostly engaged privately with Aboriginal people with wife Lucy and predominantly in Redfern. Prior to Tuesday, his most-remembered campaign comment on the subject was last week’s sharp rebuke of Bill Shorten for talking about a treaty. At that same time, Turnbull did accept Australia had been invaded by the British. In Tuesday’s speech, on what he described as this “historic day”, Turnbull paid tribute to Aboriginal people as custodians of the land, acknowledged their ill treatment and hurt, pointed to the difficult struggle for progress as well as some successes, and stressed the importance of partnership. The 37-year legal saga of the Kenbi land claim began formally with its lodgement in 1979, and dragged through multiple legal hearings. In 2000 then Aboriginal Land Commissioner Justice Peter Gray found six people from the Belyuen group to be traditional owners – which has led to some local discontent because of the smallness of the number. It took another 16 years to bring the transfer to Tuesday’s fruition, with the deeds handed over wrapped in bark paper. The surviving four of the six named traditional owners were at the ceremony. He said it had been 40 years since the Land Rights Act – which was conceived by the Whitlam government and enacted by the Fraser one – and 50 years since Aboriginal stockmen walked off Wave Hill station, triggering movements locally and nationally for land rights and representation. But he said we should appreciate what was being achieved “in the face of adversity”, in land rights – more than 40% of Australia’s land mass had been subject of successful claims – education, and combating child mortality. Turnbull emphasised the importance of the leadership of the Indigenous community working in collaboration with each other and with the government. He noted that at least a dozen Indigenous candidates are standing at the election from across the spectrum. Of these, the Coalition already has Ken Wyatt (WA) and senator Joanna Lindgren (Queensland) in parliament; Labor has its new WA senator Pat Dodson, although it has lost one Indigenous senator with the quitting of Nova Peris. “If six or seven of those candidates are successful, we will have parity in our parliament – that is, our First Australians will be represented in the parliament as they are in the population,” Turnbull said. Turnbull said that handing back land “must be done with an acknowledgement of the injustices and the trauma of the past, much of which Aboriginal people still live with today. “Prior to the arrival of the Europeans, this land, Australia, was cared for by hundreds of nations of Aboriginal people. Yours are the oldest continuing cultures on earth … The Larrakia people were and are the Aboriginal people of the Darwin region. “In policies past, Larrakia people were not treated with the respect they deserved – you were confined in reserves, your movement was restricted, your camps like Lameroo Beach were relocated to compounds and over generations, children were separated from their families. He said the successful resolution of the Kenbi land claim “shows the capacity of our laws to deliver justice to the First Australians. “Although a long and protracted process, it has produced a result that will ensure the Belyuen group and the Larrakia people more broadly have cultural, social and economic opportunities into the future – and that the sharing of benefits can occur in a way that respects the findings of Australian laws and meets the cultural requirements of the Larrakia people. “In a symbol of hope and of optimism, the Kenbi land handover will ensure Larrakia people build autonomy and independence, in a partnership based on mutual respect with all other Australians. “It will ensure your hard-fought rights are protected and managed according to the Belyuen group and the Larrakia people and that those rights are converted into economic opportunities. Turnbull said his government’s commitment “is to do things with Aboriginal and Torres Strait Islander Australians, rather than doing things to them”. It’s easy to talk, extraordinarily hard to craft Indigenous policy. Still, the talk sends messages. Turnbull’s words are encouraging, as is the fact that he made the trip, probably to the scepticism of some of his campaign hardheads, when there are so many demands on his time in these late days before the election.